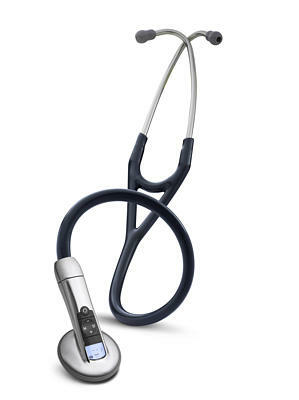 Littmann 3100 Electronic Stethoscope NAVY BLUE 27"
Hear it. With Confidence. You spoke, we listened. Our Littmann Model 3100 offers improved sound quality and ease-of-use to help you make a clear diagnosis, every time. The Littmann Model 3100’s exceptional sound quality reduces background noise an average of 85% with our proprietary Ambient Noise Reduction Technology AND amplifies sounds up to 24 times to hear faint sounds you might otherwise miss. You can auscultate immediately, thanks to our instant-on technology. The Littmann Model 3100 is easy to use for quick auscultation every time. Once on: power button quickly activates backlight for low-light conditions and the stethoscope stays in battery-saving “sleep mode” until you start your next auscultation.